The General Data Protection Regulation is the most significant development in data protection that Europe has seen over the past twenty years. There is a greater emphasis on compliance following a several serious data privacy breaches. As a consequence, penalties are considerably harsher for all organisations who control or process the personal data of EU residents. Penalties for non-compliance will be up to 4% of annual global turnover or €20m whichever is greater. The General Data Protection Regulation (GDPR) comes into law on 25 May 2018, so there has never been a more important time to ensure that best practice is in place to secure client and employee data, protect brand reputation and ensure compliance. A planned and structured approach to the inevitable changes is required for both systems and user behaviour. 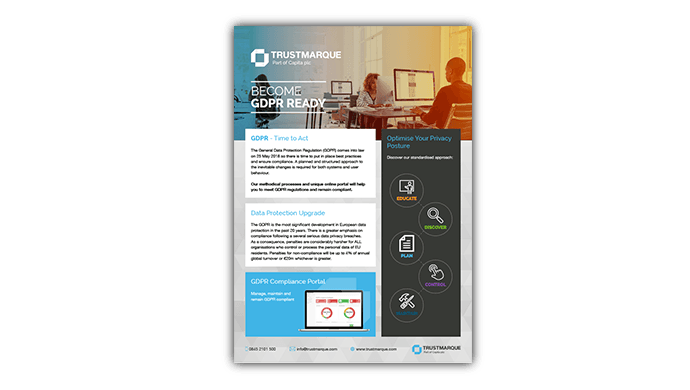 Discover more about Trustmarque’s GDPR services. Whether you are already 27001 accredited and looking to be GDPR compliant or need a more complete Information Security solution we have packages to help you get best practice in place. Our methodical processes and unique GDPR compliance online portal will help you to meet GDPR regulations. This powerful tool provides full visibility of your GDPR obligations now and helps you remain fully GDPR compliant in the future. The portal is an online platform to assess, manage and report on your organisation’s data compliance for GDPR.